Printing in full color is something most of us do without second thought. But 3D printing in full color? Until now, 3D color printing has been notoriously expensive and most people settle for monochrome 3D printers. A new device, however, is set to make 3D full-color printing more accessible and more affordable than ever before. Recently, Cedric Kovacs-Johnson, together with Charles Haider, both chemical engineering undergraduates at the University of Wisconsin-Madison, have invented a way to bring full color capabilities to most 3D printers, for under $100. The device that they created is called the “Spectrom.” This adapter upgrades monochrome 3D printers to full color ones. The “Spectrom” adapter is compatible with fused deposition modeling 3D printers that use a standard-size filament spool. 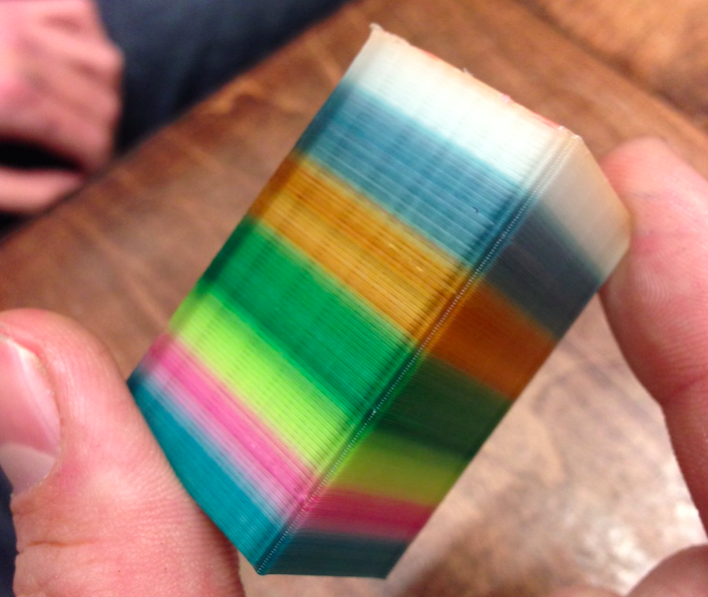 Spectrom allows 3D printers to print in a full rainbow of colors, and even enables them to shift seamlessly between colors. Spectrom adds dye to the melted plastic that the printer lays down in layers, essentially injecting colors into 3D printed objects. While standard desktop 3D printers have gotten around the color issue by simply adding more than one print head for more colors, the Spectrom doesn’t require more than one head, or a specialized printer. The idea is that you simply install the Spectrom onto your existing printer and away you go, printing in a wide variety of colors. The two students say the idea didn’t come to them overnight, it took a year and a half of experimenting and practicing before they finally landed on an idea that worked. “It was just a whole ton of trials before we looked at something and said, “Oh! That works exactly how we thought,” Kovacs-Johnson adds. Spectrom won two first place prizes at UW-Madison’s Innovation Days competition in February. Haider and Kovacs-Johnson now have a patent pending for Spectrom and are hoping to bring more people onto their team.